If I hurry, I can finish my current novel and win NaNoWriMo by midnight Japan time. All I have to do is write about 171 words per minute for the next two hours. Although I maintained a reasonably consistent writing habit, which is the entire point of NaNoWriMo, I wasn’t able to sit down and grind out the pages needed to “win”. Starting the evening classes twice a week also stole away a lot of time and although i had a lot train time my routine amounted to 1) if you get a seat, nap on the way to Tokyo; 2) get a seat at a coffee shop with free Wi-Fi and write your blog entry; 3) after the classes, if you get a seat, read all the way home because the seats are too cramped to write comfortably and you don’t want to risk looking up into the eyes of the little old lady standing in front of your seat. If I do this again next year, and I almost certainly will, I will aim to trade off some of my free days in October with my busy days in November. I’d intended to do that this year, but it didn’t work out. The results of all this were 29,524 (ish) words; a lot of world building and rebuilding; several pages of character description and character design; the basics of a plot and a couple usable scenes; the chance to use three pens in “real world” conditions (more on that in another post); a novel worth pursuing. As always, it’s been an interesting month of writing. It was easy at first, then not, and then life and work took over to make it even more difficult. I’ll keep working on the book but will also make time to finish the editing and typing projects that have been put on hold this month. This entry was posted in Life and Stuff, Personal, Writing on November 30, 2015 by DELively. I spent most of the day sitting in an uncomfortable chair waiting for one thing to happen. After it happened I kept waiting. Today was the annual competition for our youngest’s rhythmic gymnastics club. Clubs from all over the area gather and their members put on one performance along with a hundred or so other girls. The spectacle involves lots of sitting, a few speeches (this is Japan after all) and then a series of warm ups and practices. One hour after we arrived the competition started. The competitors paired off with someone of the same age group and performed their routines. The problem with RG is that each performance (ball, hoop and dance) has a different song and that meant the different competitors cycled in and out as the people in charge cued up the right song. Also, it apparently wasn’t possible for the judges to watch more than one person so only two girls could perform at the same time. The other problem is that each girl only performs once. Our youngest did a performance that involved the ball and some dancing and then got to join us in the stands to watch the rest of the performances. After that, we had to wait to see the final awards ceremony with, of course, more speeches. Along the way I wrote 10 pages for my NaNoWriMo novel (more on that tomorrow) and every now and then looked up and clapped. In my defense, everyone else was using their smartphone when their loved one wasn’t performing. Our youngest did a good job, but not a great one. The difference between good and average in RG is shockingly large. She lost control of the ball once but mostly her weakness is she lacked any polish. Her jumps and turns aren’t smooth and she didn’t seem to have much energy. She finished in the middle of the pack but far from last. Next year we’re going to have to sit down and talk with her about if she wants to stay in or not. If she does, I’ll be there again, writing tablet in hand, only watching when she’s performing. This entry was posted in Japan, Life and Stuff, Personal, Random on November 30, 2015 by DELively. Several years ago, during one of my periodic fits of organizing, I was walking through the old, creepy Itoya and stumbled across a pocket briefcase I quickly decided I could use for notes. Since then I’ve abandoned and started reusing it many times. 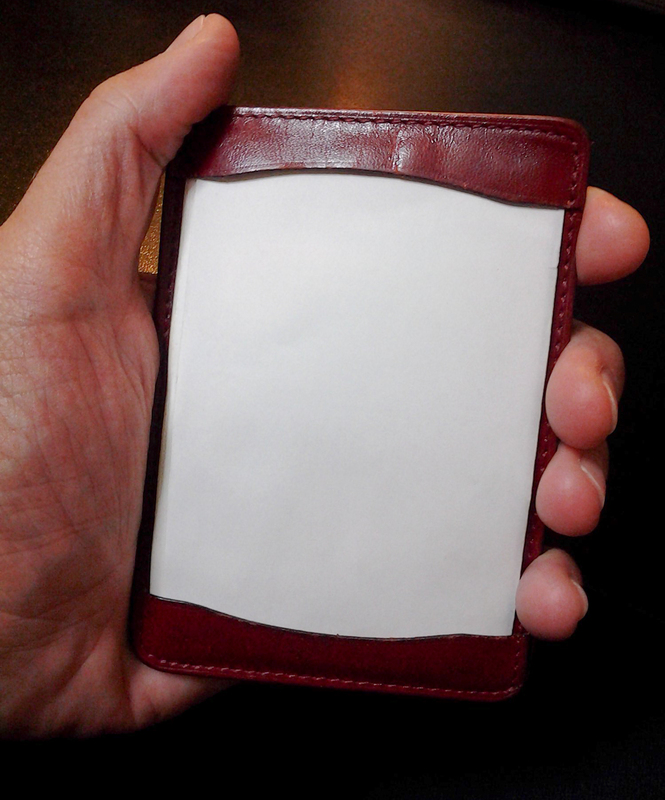 The pocket briefcase holds small sheets of paper and has a built in slot for business cards, used notes and receipts. The front flaps hold several pieces of paper and since I’ve had the briefcase, I’ve found that the backing paper and cards from small packs of tissue also fit the slots. It is about 11.7 centimeters (4.6 inches) tall by 8.5 centimeters (3.35 inches) wide. It is made of some sort of faux leather, although the slots that hold the paper are made of actual, albeit cheap, leather of the sort used to make Bible covers. The pocket briefcase fits my hand well. The pocket briefcase with the insides exposed and a Karas Pen Co Retrakt for size comparison. After I first got it I used it for writing notes and shopping lists and random notes and random ideas. It was convenient to use and I liked having the pocket for but I quickly found myself overwhelmed with the random scraps of paper, including the ones I stored in the pocket. itoya used to sell a pack of paper to fit it, but I that would be sitting at home when I needed paper so I ended up using other kinds of paper which led to messes and small piles at home. Also, the paper is not fountain pen friendly. For those reasons, I stopped using it and started using other notebooks. However, because I have a tendency to try to get my money’s worth (with a vengeance) out of stuff I buy, I started using the pocket briefcase again. Then I stopped. Then I started again. Lately I use the pocket briefcase mostly for shopping lists and, on occasion, class notes when I come up with ideas for changing the lesson plans I’m using. Despite the fake leather, the briefcase has held up well. I’ve had it for several years and only recently has it begun to show its age. I’ve not seen any suitable replacements for it at Itoya and it’s no longer the kind of thing I use that much. I’ll use it until dies and then throw it away. This entry was posted in Japan, Paper, Random and tagged Itoya on November 29, 2015 by DELively. One of my more troublesome students made monkey noises and beat his desk earlier this week when I reminded him he had two speeches to do next class. Today (the next class) he didn’t do the speeches which means he fails the term. My problem is, he’s already failed the term based on absences so there’s not much I can do. Today was the last day before the last week of classes begin which means it’s an odd time at the school where I work. It’s the last day when clubs will meet and the last day when we can, technically, keep students after school. The problem is by this point in the term we really couldn’t care less. We are making exams and walking the fine line between punishing bad students by making the exams difficult–I once told a teacher “if one of us foreign staff can pass this exam, it’s too easy”–even if it means hurting good students, or writing off the bad students and hoping they don’t do well on the exams so that the good students can do well on the exams. This is also the time of the lobbyist. Third year high school students (12th graders) have already finished classes and are in exams. This allows extra time for them to take make-up exams if they fail. It’s also the time when they suddenly realize what final marks they need vs what they’ve earned and they start lobbying for higher grades. In my case, I told my student what score he needed and told him everything he needed to know to get that score. I’m not sure he gets that I will give him a low score if he doesn’t do well. Granted, his score will still be pretty good, just not as good as someone who’s lived overseas was expecting. As I always point out, though: 1) I’ve failed returnees before. 2) am not afraid to meet parents to discuss grades and 3) the last week of school is not a particularly good time to worry about your marks. Now I have a couple days to relax before the flood hits, or as the French say apres le weekend le deluge (something like that). This entry was posted in Japan, Teaching, Work on November 27, 2015 by DELively. How many pieces does your phone have to be in before you replace it? In my case the answer was four. But even that’s not entirely accurate because I only replaced the broken cellphone when it became clear the battery was dying. I did a lot of careful research but my master plan to modernize the entire family was rejected by She Who Must Be Obeyed. I therefore began a second search. I was not married to a brand, which meant I would look at both Android and Apple products. 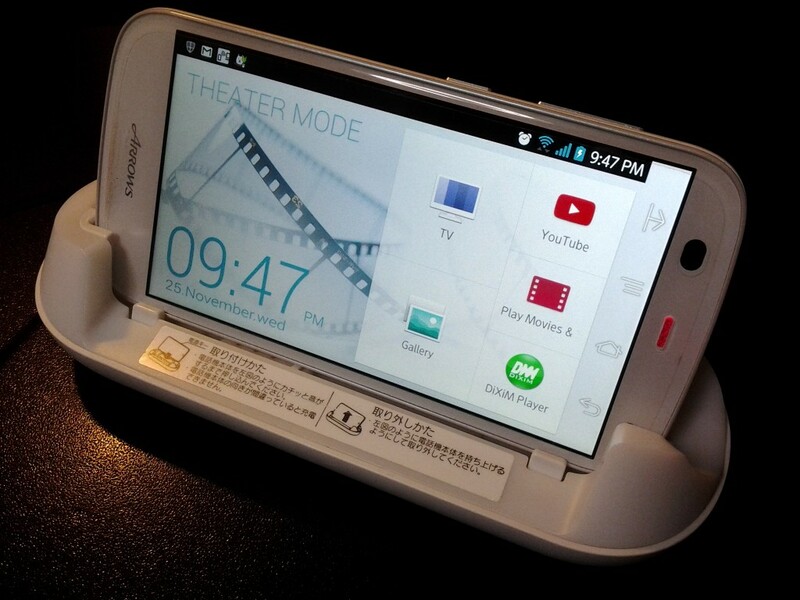 Luckily Softbank had a phone that was getting good reviews and which Android tech types in the USA were lusting over. It turns out it was a good purchase. The screen is about as large as I would get. I can reach all the corners without having to study yoga and/or dislocate my fingers or thumbs. It will fit in my jeans pocket, but it always reminds me it’s there. Without a rubber cover the plastic case is a bit slippery. The Arrows phone in the charging station. The screen is large enough for comfortably reading books on a Kindle app (more on that in a future post) and for my thumbs and fingers when I’m writing something or taking notes. I also like the fingerprint reader/touch sensitive button on the back. I can turn the screen on and swipe away the start screen wallpaper with out using my thumb. The back side with the touch-sensitive button. The three holes on the side fit the charging station. 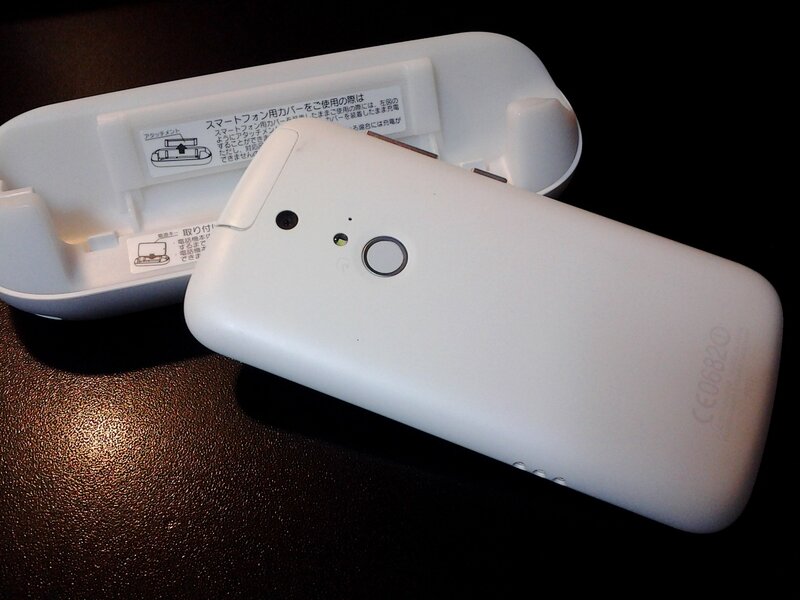 My only complaint about the phone is that I’m apparently the only person in Japan who bought one. As such, it was discontinued quickly and will almost certainly never get an updated version of the Android OS. This leaves it at late-2013 vintage unless I decided to start messing with it myself. The contract is up next May and I’ll have to decide to stick with this phone or move to another. Apple is always in the running as are other Android phones. Knowing me, though, I’ll keep this one until it’s in pieces and then I’ll try to figure out how to make it work a little longer. This entry was posted in Japan, Life and Stuff, Random on November 26, 2015 by DELively. My denial almost ended today, then I thought of another way to put something off. This time of year at the school where I work is the time of exam making. (Also known as “our time“.) Normally this would be a happy time of great joy and vengeance (because those things totally go together) but for some reason I find I can’t enjoy the making of the vengeful exam as much as I usually do. Part of the problem is that because of the way we’ve been teaching the grade I’m in charge of there isn’t a lot of material for a final exam, especially one worth 50% of the final mark. The students have done lots of speaking projects, made visual aids and even “invented” something they called “new” superheroes in the same way that kid in Texas invented that clock. The performances are usually pretty good, but there’s no way to put that on a test. Today, even though I still have lots of time, I managed to do some work on vengeful exam. I was as surprised as everyone else. I then hit a moment where I’d have to start making decisions and ran through a thought process that involved using last year’s questions without any changes; using last year’s questions but changing the second listening; using last year’s questions but changing the order; using last year’s questions AND last year’s listening recording. Mind you, I do not believe that even the students who took the test last year could pass it this year, but even I felt a twinge of guilt. Then, during class, I got an idea for a question. i made a few notes, but I’ll get to them later. Vengeance is a dish best served eventually. This entry was posted in Japan, Random, Teaching, Work on November 25, 2015 by DELively. I am now torn between being cool and not being cool or doing surgery to be cool. Several months ago I finally broke down and bought a Midori Traveler’s Notebook Journal which all the really cool kids have. However, me being me, I bought the more pocketable Passport Size as the large size takes only one kind of notebook and requires a bag if you want to carry it around. I liked it and liked that it took passport sized notebooks from Muji. It would also fit, just barely, an Eighty Pages notebook. I started using it to carry my three basic notebooks (food journal; life and work notes; writing notes). I like that it has thin but tough leather and I don’t mind the small bookmark, mostly because it can be cut off with no problem. With a little effort and a couple rubber bands it could be stuffed with extra notebooks. 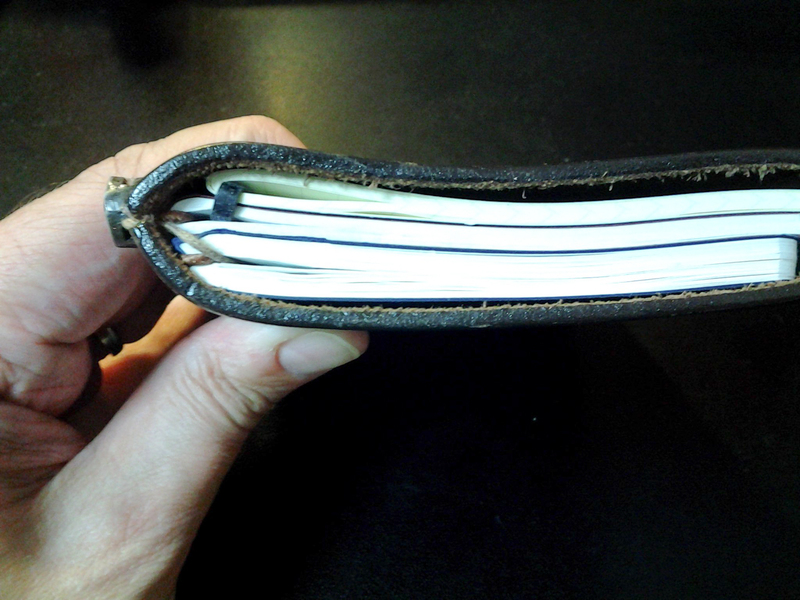 The passport sized Traveler’s cover from the top with the Eighty Pages Volume three. I wish that it was a little larger and could hold Field Notes sized notebooks–they can be forced in, but they stick out the ends–but I could forgive it because, unlike the larger version, it doesn’t require you use proprietary notebooks (or perform surgery on a notebook; more on that in a future post). The leather ages well and gets softer without getting floppy. With one exception, the elastic bands held up well. The only strap I had to tighten was the strap that holds the cover closed. It’s attached at the back and was used enough that it started to get lose. What I didn’t like almost as soon as I got it was the metal bit at the back used to bind the elastic cord and the book mark. What I didn’t realize was how annoying it would become. First, it doesn’t even lay flat against the spine. It sticks out and is large enough to cover a mechanical pencil. It’s large enough it could be used as a weight for a fishing line. I can’t figure out who at the manufacturer thought this was a good idea. It taps when you set it on a desk. It scratches the desk. It prevents the notebooks from sitting flat. I tried moving it inside the spine, but it crushes the ends of the notebooks and works its way back outside. It’s such a bad idea only people in love with the idea of the notebook cover itself can possibly forgive its existence. Cult Member: Dude, you’re too attached to material things. By scratching your desk you make it yours. Me: Piss off and stop scratching the desk. Cult Member: It’s a feature not a bug, Dude. The metal bit in its natural position next to a Kurutoga mechanical pencil. Why does this fishing weight metal bit exist? I’ve heard that, over time, the elastic bands loosen and the only way to tighten them is to remove the fishing weight, do some pulling and cutting, and then put a new fishing weight on. (Midori is more than happy to sell you a new one.) At this point I’ve heard that many people opt to knot the elastic bands rather than wrestle with the useless metal bit. If they ever come out with a version that doesn’t have the metal bit I might reconsider using them. Until then, I have something else to try. This entry was posted in Paper, Random, Writing on November 24, 2015 by DELively. As I abandoned large notebooks and planners I found myself running about with various materials: smaller notebooks, bigger notebooks, note cards and random scraps of paper with random notes on both sides. Along the way I discovered many excellent small notebooks, such as Field Notes notebooks, the passport sized Midori Traveler’s notebooks and other random notebooks. I suddenly found myself using three different notebooks at the same time (food journal; life and work notes; writing notes) and started looking for a cover to carry them all. 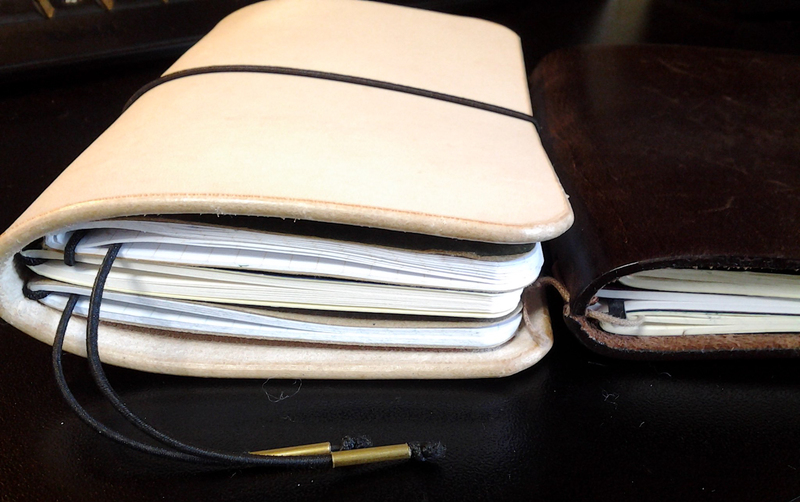 I looked at the Midori Traveler’s notebook, but it was long and reminded me too much of my old Filofax planner. It also wasn’t pocket friendly. 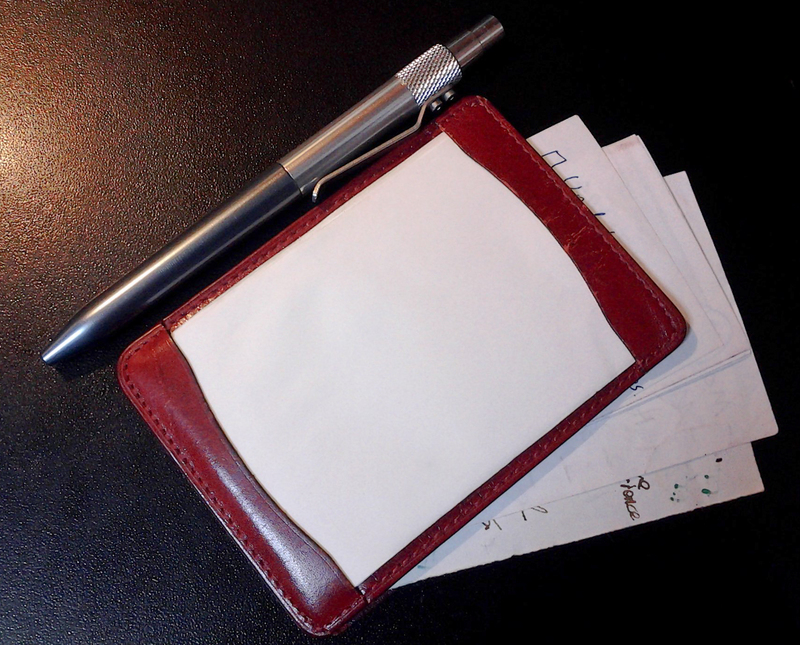 Instead I started carrying the smaller Midori Traveler’s Passport sized cover with three small notebooks in it. The problem with it is, and I’ll give it a more through review another day, most of the notebooks I like to use are too large for it. 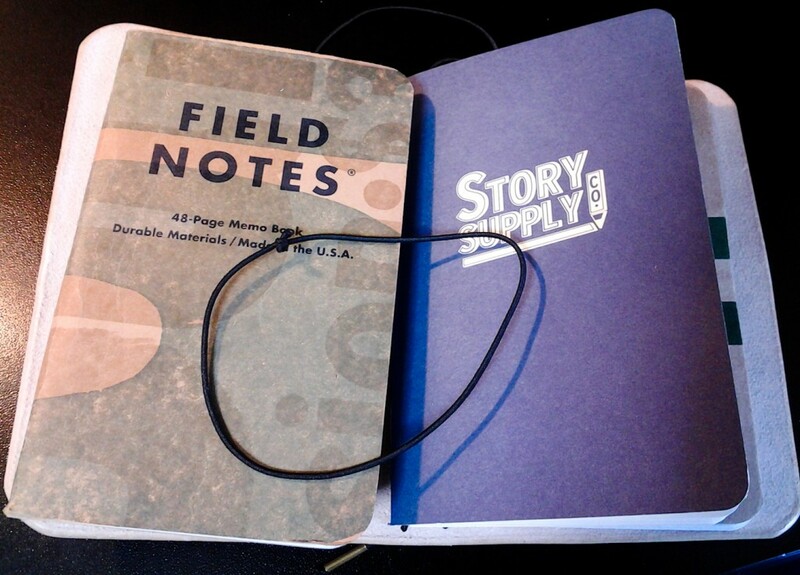 At one point I tried a Field Notes Two Rivers and had bits sticking out both ends. Somehow, and I don’t remember how, I discovered a company in Andover, Kansas named Old Church Works. 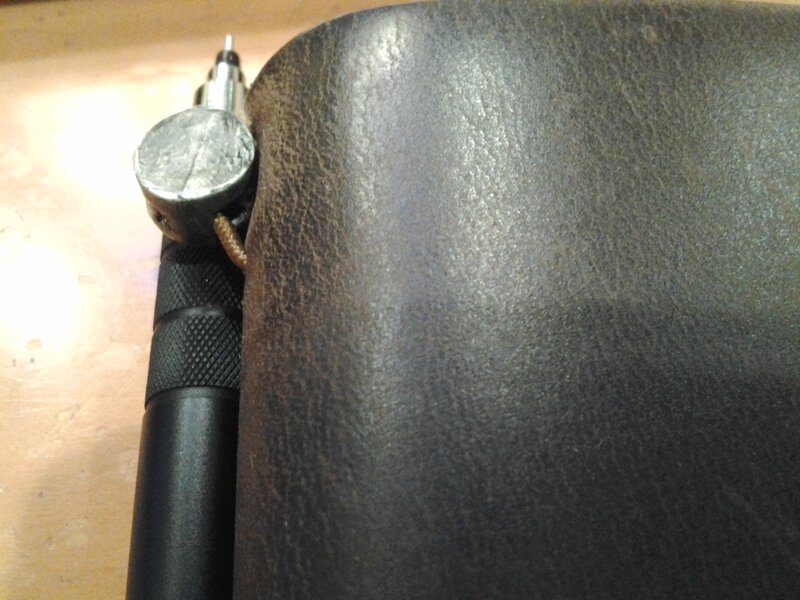 They produce several pen and notebook related items, including a number of leather covers designed to hold notebooks the same size as Field Notes notebooks. I ordered one and, after a bit of delay, have finally decided to start using it. The Quad Field Notes Leather Notebook Cover (hereafter referred to as the Quad) is bulkier than the Midori Passport, but that’s most likely because it’s new. Once I’ve had a chance to carry it around, I think it will start to soften and break in. It’s also half and inch longer than the Midori and I’m wondering how it will feel in a back pocket. The Quad is made from 6-7 ounce leather that’s been vegetable tanned and treated with bee’s wax along the edges. 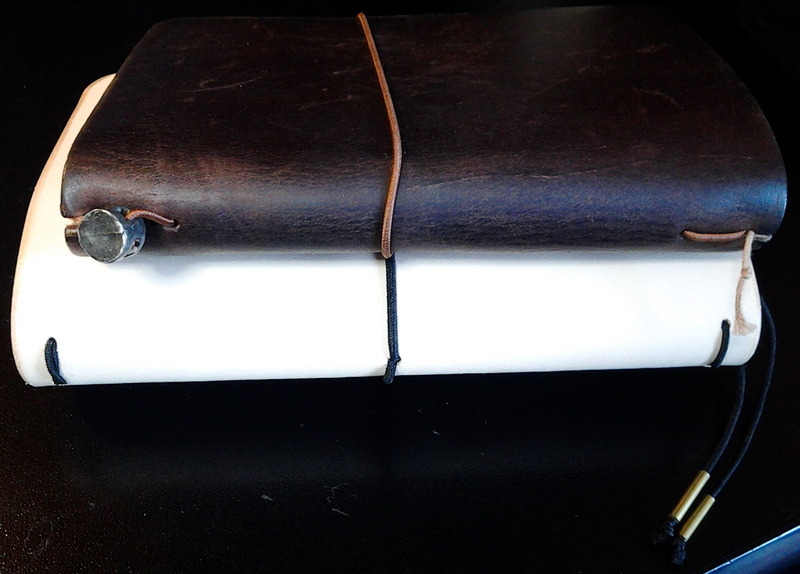 To hold the notebooks it has a long elastic cord laced through the leather to form loops. The laces are long enough to form built in bookmarks that end in brass aglets. The Quad also comes with an extra elastic strap that allows the user to attach one or more extra notebooks. The strap about ready to hold the Two Rivers (left) and the Story Supply together. The Quad also solves the number one reason I’ve been annoyed with the Midori: the metal bit. Midori fastens the straps and the book mark together with something resembling a fishing weight. It sticks out and has a tendency to tap and scratch tables and desks. (More on that in the future post.) The Quad simply uses lacing and knots to hold the straps together. The fishing weight on the top notebook cover. You can also see the length differences in the two covers. Right now, the only early annoyance with the Quad is that the book marks are the ends of the straps meaning there’s no way to get rid of them without performing surgery on the straps. They look good and the brass aglets are nice looking and less tappy and scratchy than the fishing weight on the Midori, but I don’t really need bookmarks and they hang out farther than they need to for pocket carry. I wish they were tied in as a separate piece so that I could remove or add them at my pleasure. But we’ll see what what I think in six months or so. Until then, check out Old Church Works website . The history of the name is an interesting story. This entry was posted in Paper, Random, Writing on November 23, 2015 by DELively. I managed to finish my NaNoWriMo pages for today, but between bursts of writing, I needed a distraction. Because it was another day when I couldn’t be bothered I ended up watching a game more than I played it. It turns out I’m actually pretty good at that. Although World of Tanks is a free game, it makes its money by selling special tanks, premium time that lets you earn more in game “money” and experience when you play, “garage” slots so you can acquire more tanks without having to get rid of any and “gold” which lets you buy other special tanks and special equipment. Every now and then, as a way to improve their viewership, game streamers will giveaway gold, or premium time or special tanks to their followers. On the days I can’t be bothered to play, I’ve had good luck winning some of those special things. In order to win you usually only have to make a comment or type a certain code and you are entered in the drawing. Over the past several months I’ve won two special tanks, “gold”, premium time, a garage slot and a t-shirt. Faced with that luck, over the past 24 hours I watched snippets of Tanking for the Troops which is an occasional game streaming “telethon” that helps raise money for Operation Supply Drop. which sends crates of games and game related items to deployed service people and those in veterans’ hospitals so that they might enjoy a bit of distraction from the brutal reality around them. My cousin (a U.S. Marine) told me about how World of Warcraft was his distraction in Afghanistan between work, bouts of boredom, and random threat alarms. I, of course, was in this for myself. By merely commenting I was automatically entered in drawings and won “gold” and a special tank. All this for being snarky a couple times an hour. Once I had mine, er, after winning, I made a small donation to Operation Supply Drop. The trouble is, to use any of this free stuff, I’ll actually have to be bothered to play the game. Not an easy thing to do with exams coming up. Maybe I’ll just watch more streams and see what I can win. This entry was posted in Life and Stuff, Random on November 23, 2015 by DELively. I annoyed our youngest today. Like all kids under the age of teen, she has a natural desire to help out and do stuff. However, because she’s a tween, she apparently only likes to help out and do stuff once. She Who Must Be Obeyed and our oldest were off to visit schools today which left me in charge of our youngest and random chores. The other step was to take down and fold the laundry from yesterday. (That’s another post. If I’m smart I’ll never write that post either.) I took the dry laundry off the hangers and handed it to our youngest and said “fold this”. I had to provide a little instruction but she did a good job. Later, it was my job to throw together some lunch. I reheated yesterday’s mushroom rice and whipped up a wilted spinach salad with bacon, tomato, olive oil and a dash of lemon juice. Our youngest seemed to enjoy the meal. After we ate I cleared the table and told her to do the dishes. She went into preteen mode and ignored me. Later, when I reminded her to do the dishes, I got the “why?” and, oddly, I gave her an answer that didn’t involve “I told you so”. I told her I’d cooked and she got to clean. Also, it wasn’t that many dishes and I would do the biggest and most dangerous things (frying pans and knives). She grunted a response (which is clearly proof she’s practicing to be a teenager) and did nothing. Eventually, I had to remind her to do the dishes. At that point she did them and even dried them and put them away. This entry was posted in Life and Stuff, Personal, Random on November 21, 2015 by DELively.